Chevrolet Cruze SS: It's The Shitbox Sport! 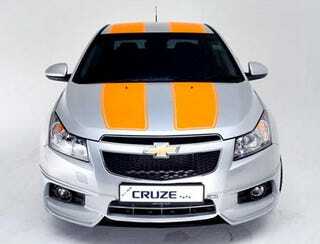 Chevrolet Singapore is offering a stripe-and-dam body kit for the Chevrolet Cruze. The package, dubbed Cruze SS, includes illuminated sill plates and costs the equivalent of $3500. So, wait — now people are paying for corporal punishment? Several people have pointed out that the Cruze SS bears a passing resemblance to the Bumblebee/Camaro character from Transformers. Since that movie made us dry-heave into our Optimus Prime Unicron Orson Welles commemorative hoodie, we remain indifferent. Ok, not indifferent. More like kind of icky.